Joseph “Joe” Siegelman is the managing partner in The Cochran Firm – Birmingham office. Joe’s practice focuses primarily on complex civil plaintiff litigation in the areas of civil rights, wrongful death, products liability and mass tort litigation. He is admitted to practice in all Alabama state and federal courts, as well as in California and the District of Columbia. Joe has represented hundreds of individuals and recovered millions in verdicts and settlements on behalf of his clients. 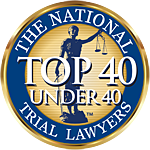 The National Trial Lawyers has named Joe to its Top 40 Under 40 since 2017, and Super Lawyers selected Joe as a Rising Star, a distinction given to only 2.5% of lawyers in the state. In 2018, Joe ran for Attorney General of Alabama and received the Democratic nomination, becoming the youngest nominee for that office since 1970.